There are thousands of invisible signals bouncing around us all the time, and the world would be a very different place if we could see them. 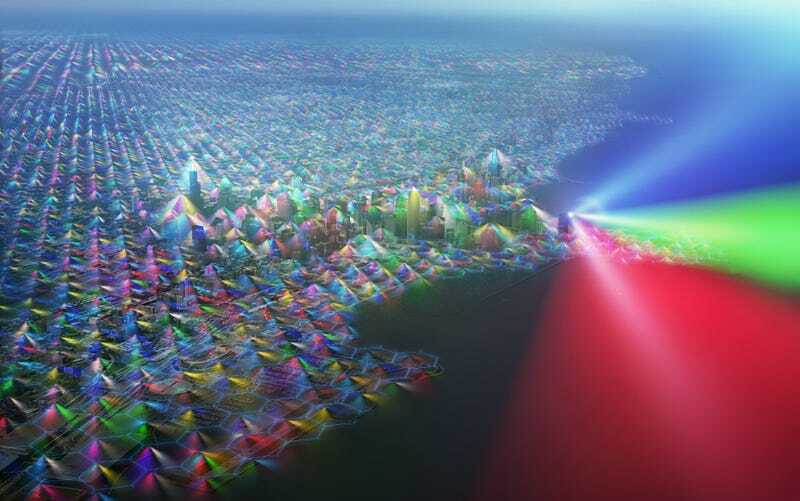 Visualizer extraordinaire Nickolay Lamm already showed us what the Wi-Fi noise would look like, and now he's back to illuminate the cell phone signals all around us. It's trippy. At first glance, the visualization just looks like some sort of indeciperable honeycomb rave, but there's a whole lot of science behind the hexagonal blanket of blinding colors. A regular, hexagonal grid of cellular base-station sites is conceptualized for Chicago [above], with stations at the corners of the hexagons. The area within each sector antenna radiation pattern has different users being assigned different frequencies and their signals combine to form a single perceived color in that instant. Different channel combinations from sector to sector are indicated by different colors. The channel combinations shown are not static, but rather change rapidly in time as different users are assigned different channels. But, if you were to take a photo of these rapid changes, you'd likely see a wide array of colors as seen in the illustration. Near the downtown area more users are likely to be found and the hexagonal cells are smaller to serve approximately the same numbers of users found in larger cells elsewhere. Antenna signals extending beyond the original cells provide coverage over part of Lake Michigan. And the blinding base station at the at the Herbert C. Hoover Building in Washington D.C.